The cool crowd, Danish style. 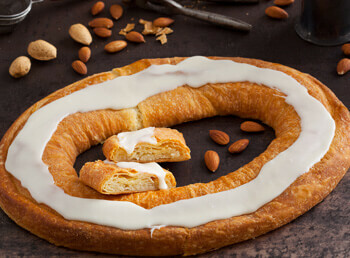 While everyone has their own personal favorite flavors, we have asked our customers and they have responded with a list of our most popular Kringle and bakery items. 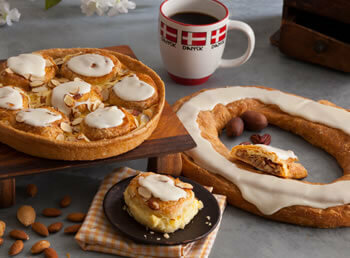 Whether it is for you or someone else, you will be sure to enjoy these Danish Delights! 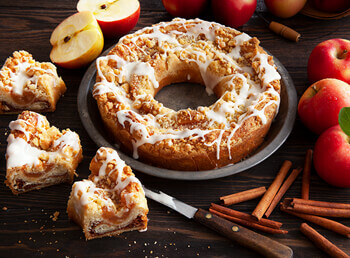 Apple Cinnamon Coffee Cake — $23.99 Fresh apples and cinnamon - these are a few of our favorite things. 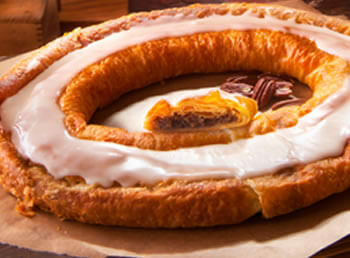 This coffee cake has layers of cinnamon infused in a ring of apple goodness; made with our famous Danish pastry. It's topped off with crumbly streusel and creamy icing. Warm this coffee cake in the oven, brew the coffee, relax and enjoy every bite. Danish Layer Cake — $69.99 This is our most popular cake that is unique to Racine and devoured by out-of-towners. 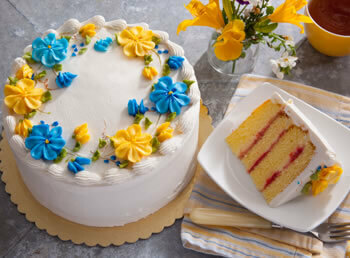 This Danish culinary masterpiece consists of three layers of our homemade raspberry jam and creamy custard between four layers of our moist yellow cake and iced with our super-smooth buttercream. Each Danish Layer Cake is hand made and hand decorated by our expert cake decorators. 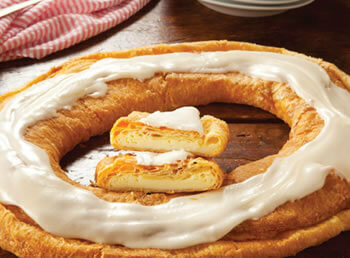 Apple Kringle — $21.49 Our classic Apple Kringle in our traditional flaky pastry is one of our favorites. 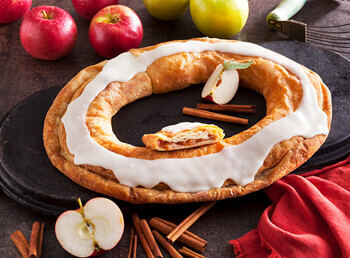 We have lightly sprinkled crisp Michigan apples with cinnamon and added a fabulous spiced sauce that makes this Kringle a favorite for everyone! 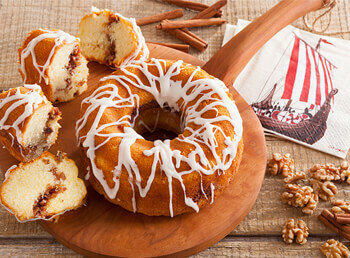 The Danish Crown Cake — $22.99 Our Danish Crown Cake combines swirls of buttery sweet cinnamon and golden California walnuts, which are blended together with sour cream to make this crown cake extra moist. It is perfect for brunch, coffee or dessert and just like Grandma used to make! 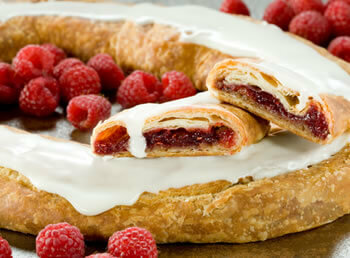 Pair of Pairs — $45.49 Our two most-asked-for bakery items! 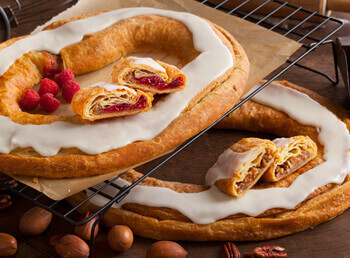 Our award-winning Pecan Kringle is made with fancy pecans and then blended expertly with brown sugar and cinnamon. 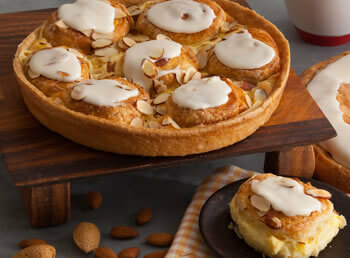 It is a perfect complement to our Seven Sisters Coffee Cake which is made by layering our pastry with creamy almond filling, silky smooth custard, and seven spiraled rolls. A perfect go-together for friends and family.